Rural Airstrips Agency has assured the Governor of East Sepik, Hon Allan Bird that the agency is committed to restoring and maintaining rural airstrips in the province. In a meeting with RAA representatives on Monday 14 May, Mr Bird said his Government was expanding the agricultural base of the province by strengthening and increasing the volume of cash crops already farmed by his people such as cocoa, vanilla and oil palm. He said the ESP Government is also developing new agriculture projects such as large scale rice farming with internal and external investors. He said transport infrastructure in the province is important to realising his governments plan and as such, they have re-opened collapse bridges, fixed broken roads, and re-decked important bridges in the province in the space of a few months. The Governor believes re-establishing important yet closed rural airstrips for his isolated communities, will bring more of them into the agriculture market base of the province, as well ease their access to social services such as health and education. 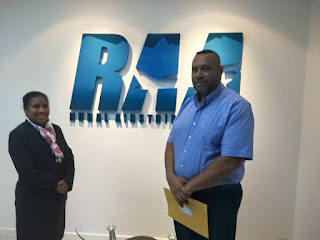 RAA CEO John Bromley assured the Governor that the agency will work with the East Sepik Government to restore important rural airstrips in the province. “ We were pleased to meet with the Governor, and start a relationship going forward to will benefit some of the geographically isolated populations of the East Sepik Province, so that they can play an active part in the development of their province,” Mr Bromley said. RAA is the agency responsible for restoration and maintenance of rural airstrips in PNG, as directed by the NEC.